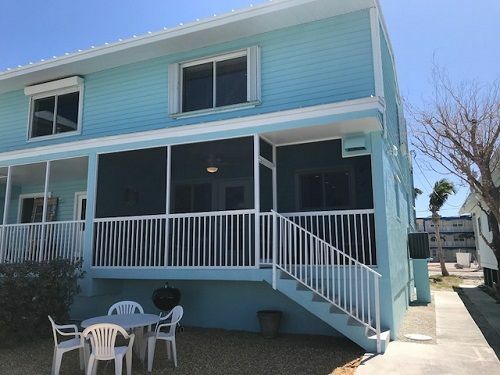 This lovely 2 bedroom, 3 bath, half duplex is located in the much desirable Key Colony Beach. Key Colony Beach is a small friendly, walkable island in the center of Marathon, the heart of the Keys. Location is key, as this home sits at the base of the canal and boasts stunning water views and easy access to the Atlantic Ocean. Enjoy morning coffee or afternoon vino on the spacious screened porch. A cozy backyard allows guest to relax and take in the tropical evening breeze. A queen bed in the master, a full bed in the guest room and a sleeper sofa provide ample sleeping space. The home includes a full laundry room, bait freezer, dock and wi-fi and best of all...complete access to the Cabana Club. Come relax and enjoy all the Florida Keys has to offer! The house was absolutely amazing. Fresh updates, super clean and very comfortable. Great location, right across from the Cabana club and Havana Jack’s - get the pretzel!!! Excellent stay, this property is perfect. Very well cared for, beautifully clean and updated, comfy beds, lovely decor, they've got it all! The kitchen was well stocked, lots of linens. There was not a thing we needed. The neighborhood is great for families, we enjoyed walking and biking every day. A very pleasant stay! Great location, pretty place, would definitely recommend it! The location is great, at the end of the canal and about a 2 minute walk from the Cabana Club with the beach, ‘restaurant’/bar and pool. You enter on the canal side through the screen porch to the first level dining/kitchen area, a full bath and a very handy laundry/pantry room. Up a half flight to the nice sized living area with huge tv, and a balcony on the street side. Up another half flight to 2 bedrooms and 2 full baths. The different levels help give it privacy for all. The home is very well equipped and even prettier than the pictures can show. Everything is bright, clean and well cared for. I definitely recommend this place! Very nice place in a great location. Very nice place in a great location. Looks like it was just remodeled and very clean. Good value for the cost. Clean and comfortable, great location. This was our 5th family trip to KCB but 1st time at this property. The home is across the street from the Cabana Club, making it a great location for families. Plenty of room for our family of 4. We visited during Christmas break and the property was decorated with a lighted tree and holiday linens for bedrooms. Very thoughtful! This place is awesome.. beautiful and quiet. Nothing negative whatsoever. Loved it. We stayed here for a week.. didn't want to leave.. the layout was great and the neighborhood very quiet. Everyone was very nice. Would rent again in a heartbeat.